Thirty one of Tocal's 86 convicts with seven or 14 year sentences received a Ticket of Leave before their sentences expired, thus obtaining an early release. Forty two of Tocal's 56 convicts with life sentences also received a Ticket of Leave, their first step towards freedom. Tickets of Leave could be revoked by a magistrate for minor offences and the holders returned to Government service. Many Tocal convicts lost their Tickets for various offences such as being absent from the district, horse stealing, passing counterfeit coin, being drunk and disorderly, disrespect to their master, and tippling (drinking) in an unlicensed house. While a convict could lose his Ticket for bad conduct, he could also gain one for bravery. James Shields was a convict overseer at Tocal in 1830 when the Paterson Bench recommended him for a Ticket of Leave for 'apprehending four bushrangers and bringing to justice one harbourer of bushrangers'. 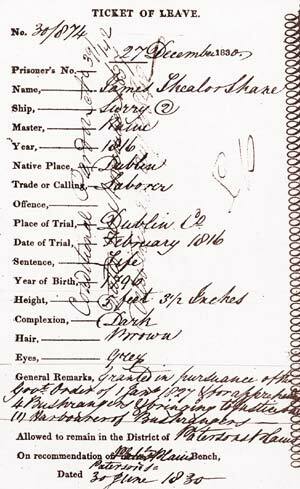 Right: record of a Ticket of Leave granted to a Tocal convict for apprehending four bushrangers. George Stotter gained his Ticket of Leave in similar circumstances. While employed at Tocal in 1837 as 'farm constable' he gained a Ticket for bravery in apprehending 'two notorious offenders'. The following year he shot and killed a runaway convict who was about to shoot a free-immigrant worker at Tocal, and received a Conditional Pardon for his courage.